Others have written about the broad scope of the event (including local news media, as well as this great shout out to us by Gizmodo’s Rae Johnston), however the focus of this article will be Retrospekt’s interactive gaming history museum, dubbed the Five Decades of Games area. 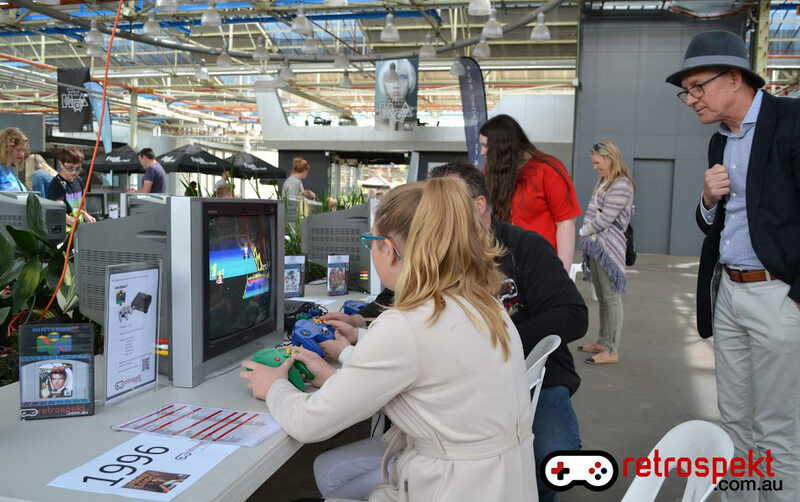 Although Retrospekt has been involved in running similar areas at AVCon, PAX Australia, and others over the last half dozen years, this was our biggest single undertaking of its kind to date. In addition to over thirty consoles and computers (and yes, there were a number of cruel omissions we had to make), we aimed to organise our area chronologically to enable guests to travel through the ages of gaming, from early Pong, Atari, Coleco, and Commodore machines, through more recent 2000s era consoles from Sony, Microsoft, and Nintendo. In addition, AVCon were on hand to support our area with the latest generation consoles. Walking through our well-signposted rows of gaming machines from the 1970s through to the present was a surreal experience, yet it clearly demonstrated the gradual evolution (with the occasional obvious leap) of interactive gaming technology. There were a number of other highlights over the four days of HWA. Bajo and Rad from the ABC’s Good Game Spawn Point swung by the museum, were ultra friendly and knowledgable, and were suitably impressed by our setup. In addition, they were interviewed by Paul, with the interview to be posted later this week. On Friday night HWA’s music event supported by Fat Controller and Futuresounds Adelaide showcasing Freezedream, Hartway, Only Objects, Nakatomi, Electric Fields, and Nina Las Vegas was fantastic. The venue, lighting, sound, haircuts (yes, you read that right), and of course the performances were all phenomenal. We highly recommend attendance and future HWA music nights, and hopefully this is something that is embraced by the public and expanded upon in coming years. The crowd over the four days were predominately families. It was obvious that as word of mouth spread about the event, the number of attendees increased each day. Hundreds of happy punters moved through the Retrospekt area during each day, and by the end of it with very few console casualties (despite a few of the crew being worse for wear), the event was ultimately a great success. We wish to thank everyone involved in Hybrid World Adelaide (as well as every single Retrospekt and AVCon volunteer) for involving us in the event, and we look forward to even bigger and better success for this pioneering and visionary endeavour in the years to come.